ML-53 three convolute expansion joints are contour molded of Teflon® brand PTFE by a patented process. The expansion joint uses limit bolts to prevent over extension. 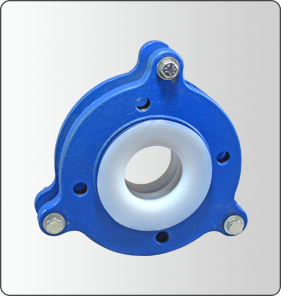 The flexible element is formed over the full sealing face of the end flanges eliminating separate gaskets. PTFE Expansion Joints are used to compensate for movement, misalignment and/or vibration in piping systems. Generally, the more convolutions in the joint design, the greater the range of motions it can compensate. It's unique compact design makes it ideal for tight spaces. They are corrosion resistant, non-aging, with extraordinary flex life and reliability. The ML-53 offers extreme chemical resistance and strength.